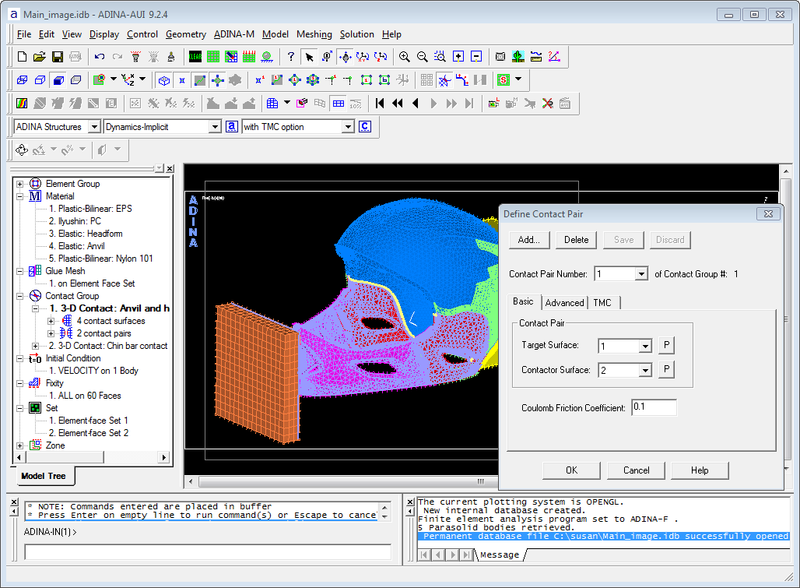 The ADINA User Interface (AUI) provides the complete pre- and post-processing capabilities for all the ADINA solution programs, offering a fully interactive graphical user interface for all the modeling and post-processing tasks. The ADINA User Interface allows enhanced solid modeling with the addition of the ADINA Modeler module. With the optional ADINA Modeler module, model geometry may be directly created, imported from various CAD systems that support Parasolid (e.g. NX, SolidEdge and SolidWorks), or imported through the IGES interface . Physical properties, loads and boundary conditions can be assigned directly on the model geometry. Finite element meshes can thus be modified without affecting the model definition. Fully automatic mesh generation can be used on general geometry with flexible control over element size distribution. Mapped meshing can be used on simpler geometry. A session file keeps track of user input and selection during model creation. The entire model can be recreated by playing back the session file. A different model can also be created by modifying the session file. A fully interactive graphical interface with pull-down menus and dialog boxes for selection of options and input of values. Icons for quick access to commonly used tasks. Copy and paste feature for the graphics window. Direct creation of AVI movies within the program. Output of graphics in vector or bitmap formats. Dynamic rotation, zooming, and panning of the model. Support of command file input for often repeated tasks. Deformed and original mesh plots. Plotting of variables on graphs. Listing of variable values on screen or file. Definition of resultant variables from output variables.